This creature is the second largest rodent in the world. He can be found only in a few places in the world, including North America, Scandinavia, Russia and Geneva. 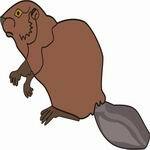 Years ago, beavers were hunted for their fur, musk glands and tail. People wore the fur, made perfumes and medicines from the musk glands and ate the tail. Beavers live in lodges which they build in rivers and streams from small trees and mud. They build a dam first, then the lodge which looks like a dome on top of a pile of wood. The entrance is under the water which keeps out other animals. Beavers can stay under water for about fifteen minutes. A beaver might live for 19 years, and weigh 60 pounds and get to a length of four feet. They mate for life and are very social animals, living and working together with other beavers. They eat fresh bark, water plants, berries and fruit. Their large front teeth help them chew through the bark of trees, both to build their lodge, and to eat the bark. After being hunted almost to extinction, the beaver population has survived. Males and females reach sexual maturity at about 21 months. Once mature, they will breed evey year around February. Gestation lasts from 105 to 107 days. In May they will have a litter of three to five kits. The kits are born fully furred with open eyes. Two weeks after birth they are ready to make their first venture outside the lodge. They are weaned within two months, but will not leave to seek out their own territory until they are two years old.